In order to upload your website's products to Facebook Product Catalog List, you need to have your website's Product Catalog URL which can be found in WooCommerce Conversion Tracking. Read this documentation to know the process. 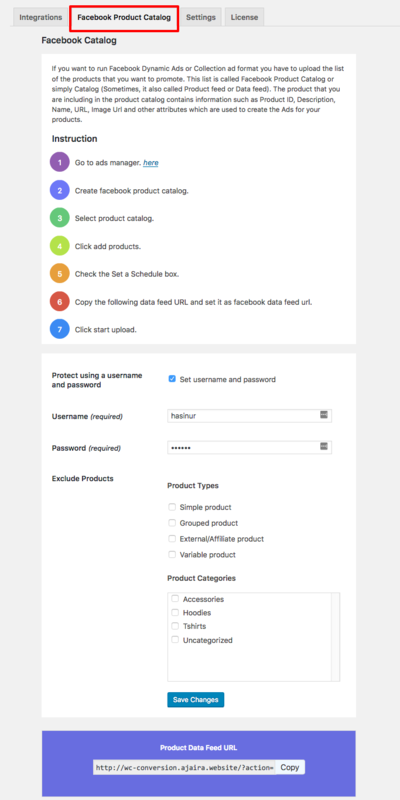 Login to WP Admin Dashboard → WooCommerce → Conversion Tracking → Facebook Product Catalog (tab). To find the URL, navigate to WordPress Admin Dashboard → WooCommerce → Conversion Tracking → Facebook Product Catalog. Don't forget to click on the Save Changes button. You can read the How to Use Your WooCommerce Conversion Tracking's Data Feed URL / Product Catalog URL in Facebook Product Catalog segment of this page to learn more. While you are uploading products to Facebook Product Catalog, you can exclude products by using Product Types and Categories. Just check the Type and Categories that you don't need to upload. If you want to run Facebook Dynamic Ads or Collection Ad format you will have to upload the list of the products that you want to promote. This list is called Facebook Product Catalog or simply Catalog (sometimes it is also called Product feed or Data Feed). The products that you are including in the product catalog contains information such as Product ID, Description, Name, URL, Image URL and other attributes which are used to create the Ads for those products. Click on Ad option and after that, you will be redirected to the following page. Hit the Close button. Now, click on the Ads Manager menu button. After that, you will see a mega menu popping out on the screen. Select Catalogs from the menu items. Now, click on Create Catalog button. Now, give a unique Catalog name and after that hit the Create button. In this stage, you will get a success message mentioning that you have created a Catalog successfully. Now, click on View Catalog button. Next, you will get two options to upload your products – One is Upload Once and the other is Set a Schedule. Select the Set a Schedule option. If you do so, then you will get an input option to insert your website's Data Feed URL. Enter the Data Feed URL that you found in WooCommerce Conversion Tracking. After inserting the Product Catalog URL hit the Start Upload button and you are done!